The income opportunities you now have with Store Buildr are endless. However, we know that ambitious marketers want to take things to another level and that's why with much deliberation we have decided to offer a limited number DEVELOPER RIGHTS licenses for Store Buildr. This means you can create an unlimited number of sites for clients and also sell each site you create as many times as you wish. Think you can't do this? Think again, as a Store Buildr Developer you will receive all of the training and support you need. In no time at all you will become an expert website developer and reseller and also run your own web hosting company should you choose to do so. This comes with basic training and also advanced training. You can create and sell an unlimited amount of the Store Buildr websites we provide. Store Buildr Developer License Terms. [YES] Websites you create can be sold for a minimum of $17. [NO] Websites you create cannot be offered as a bonus. [NO] Cannot change the niche of any website. IMPORTANT! You can sell an unlimited number of sites while you maintain an active Developer membership. Should you choose the payment plan then cancel your Developer membership before the payment plan been completed then the above license terms will be revoked. Existing sites that you have sold up to the point you cancel can still remain active, but you will be responsible for maintaining active support & updates. Yes Guys, I am Ready to Take my Business to The Next Level! What is the difference between this and Store Buildr Elite? With Store Buildr Elite you get to clone our website selling business and promote our websites for 100% commissions. As a Store Buildr Developer you get to license our website selling business. This gives you a lot more control as you can command a higher price and have more flexibility. The Developer License actually compliments the Elite program perfectly. You install and deliver the websites for your clients. We show you exactly how to do this in the members area. Remember you can offer additional services such as web hosting. We have been designing and selling websites since 2004, so we know how to create a niche targeted website that is designed to sell. You can be confident in selling an in demand product. Nope, you don’t need any skills whatsoever! It’s all point and click simple. Plus, in the Members Area we provide you with FULL STEP BY STEP training how to get everything set up, this includes absolutely everything, no matter what skill level you are at this will work for you. How much can I sell the websites for? 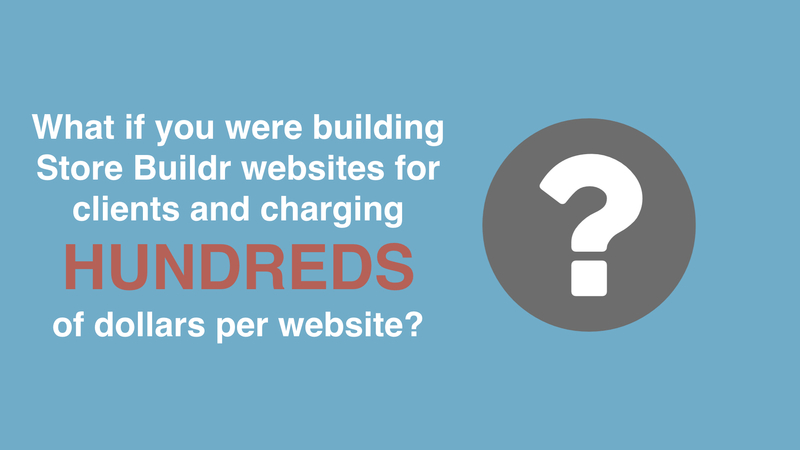 We recommend around $100 for a fully built site with a domain name, but you could command a higher price for a custom install. How much can I sell hosting for? How much will it cost me for reseller hosting? You can get reseller hosting for just $15 per month, meaning just one sale can put you in profit. Do I have to offer web hosting to my clients. No, this is not something you have to do, you can install the websites on your clients server if you wish. However it’s nice to give the client a choice.